Böttcher’s expertise in the printing rollers industry is founded on nearly three centuries of technological innovation and research. Today it is still a private company, which has expanded and established itself on the world market. Böttcher provides the perfect synergy for printing blankets, printing rollers and printing chemicals. Each of these is engineered and designed from the outset to optimize the interplay of components in its specific area of application. On rollers, on printing blankets or in fountain solutions. But modern offset printing requires much more today: perfect harmony of all material factors within a highly effective system. Extensive expertise in all printing systems, from offset and flexography to gravure and digital printing. Sophisticated solutions for all process phases, from extruding, coating and laminating to printing and finishing. Excellent results throughout the value creation chain, from raw material production to the finished, ready-to-pack product. All products and services are available in consistent quality worldwide. Materials designed to meet specific requirements and conditions of every single application. As these adopted processes enhance the quality of your print products and extend the service life of printing components, you will also gain important ground in the race against your competition and increase your profits. Washes, perfectly adapted to the requirements of users, presses and environment . Böttcher is also one of the world’s leading manufacturers of washes and maintenance products for blanket and roller cleaning, with a range of dedicated washes tailored to the specific needs of each type of automatic washing system. 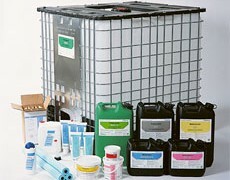 In the area of solvent filtration, no-one has more experience than Böttcher. These products have been tested and approved by press manufacturers. 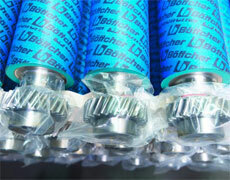 Böttcher is the world’s number one roller supplier. Our rollers are to be found as original equipment on more new sheetfed, Newspaper & heat set press installations than any other brand. For a good reason: Böttcher has developed specialised inking and dampening roller compounds for all types of modern inks. For UV inks and for dual purpose printing Böttcher offers specifically formulated rubber compounds, which are OEM standard on most new printing presses due to their excellent all-round performance and long service life. Within the range of dampening roller compounds, Böttcher offers both solutions for standard printing with alcohol and for alcohol-reduced and alcohol-free printing. Beyond that, special dampening rollers for UV applications are also part of the Böttcher portfolio. A team of specialists constantly works on new developments and creates roller materials which keep pace with the latest developments in the ink and coatings market. For example, a new Böttcher UV compound offers improved stability due to its particularly resistant composition with regard to modern UV inks. Similarly, we also developed a roller compound specifi¬cally for use with vegetable inks. To sum it up, we offer to the user a more stable printing process and longer roller life. The blanket transfers the print image to the sheet and has thus a very special influence on the printed result. Particularly the texture of the surface and the structure and compressibility of the carcase determine whether the printed image appears in the desired quality on the sheet, independent of run length and printing speed. Exact dot reproduction, rich, even solids, quick sheet and web release and reduced piling and linting, all these criteria are achieved with the aid of Böttcher products. Excellent smash resistance and gauge stability guarantee top performance. And this quality pays off, as printers who use optimum printing blankets and coating plates work much more economically. With the BöttcherTop rubber blanket series, Böttcher offers particularly balanced blankets for each application. 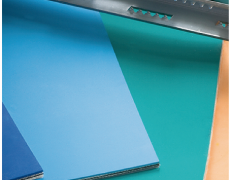 Versatile rubber surface layers on stable and durable carcases offer a reliable solution for use on a wide range of ink systems and paper stocks. Böttcher‘s extensive experience in the development of rubber rollers gave birth to a new generation of printing blankets with a very wide range of applications for all aspects of offset printing. Böttcher is breaking new ground in blanket R&D: The Twin-technology with two compressible layers in a printing blanket, combines the advantages of both hard and soft blankets. Excellent mechanical resistance and reduced heat build-up are advantages of the new technology and guarantor for a perfect print result. Coated prints- especially for the packaging industry – often simply look better. The printed sheets become resistant to scratches and the product can be handled and finished quicker. Böttcher offers an extensive range of coating plates and blankets for flood and spot coating – Talk to your representative about our sensational BT1001 coating plate today!